Preheat the oven to 350˚F. Start heating 4 cups water in a pot. In a medium pot, sauté the onion in 1 tablespoon olive oil over medium heat until translucent. Add the rice and toast for 1 or 2 minutes. Add the white wine and reduce until dry. Slowly add hot water to the rice, approximately ½ cup at a time, stirring frequently. 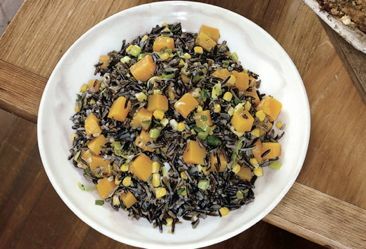 Wild rice will take a while to cook (at least 1 hour) and will absorb a lot of water. Keep stirring, adding water in ½ cup increments as it gets absorbed, until the rice is tender. While the rice is cooking, peel the butternut squash. Remove the seeds and cut the squash into small cubes. In a mixing bowl, dress the diced butternut with salt, pepper, the remaining 2 tablespoons of olive oil, and the brown sugar. Spread on a lined baking pan and roast in the oven until tender, approximately 35 minutes. While the squash is roasting, sauté the cauliflower in butter until brown and tender. To serve, mix the roasted butternut squash into the rice. (You may not need all of it; reserve some for a later use if it seems like too much.) Grate in some zest from the lemon and spoon the mixture into serving bowls. Top with the roasted cauliflower, brown butter, and parsley.